At some point in my young model rocket career, I owned an Estes Orbital Transport, but I am going to try to procure one through an eBay auction. The one I won on eBay is pictured below. The Orbital Transport was an early space shuttle concept that used a high altitude airplane to lift the orbiter to the edge of space and then the orbiter would launch itself into orbit. The solid rocket booster and powered shuttle ended up winning out, as evidenced by our now-defunct Space Shuttle (Space Transportation System - STS) project. Interestingly, the system being developed by Burt Rutan's Scaled Composites Virgin group, "SpaceShipTwo," is akin to this Orbital Transport. 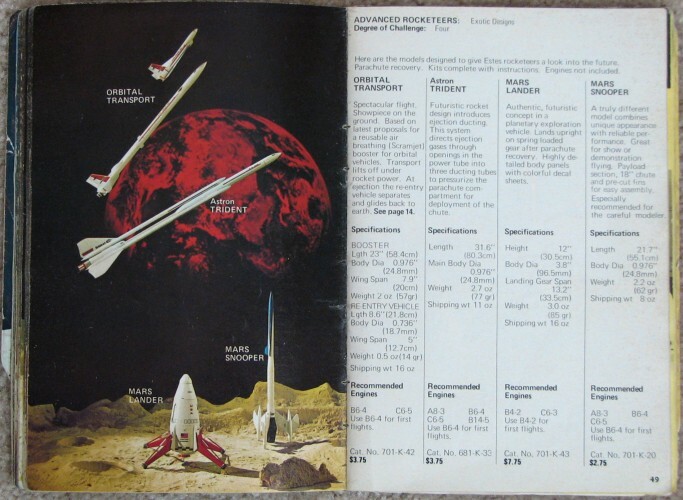 Below are pages 44 and 45 out of the 1971 edition of the 1971 Estes Model Rocketry Catalog that featured the Saturn V and Saturn 1B models. Here is the Astron (Estes) Orbital Transport model rocket kit that I won on eBay. It is part of the collection I am attempting to assemble that represents Estes model rocket kits that I had as a kid back in Mayo, Maryland.